When most people turn on the faucet, they give little thought to where the water comes from. But Springfield has one of the best water systems in New England, water that has been ranked nationally, all due to the foresight the city had over 100 years ago. I picked up a fascinating book on eBay describing nearly everything you might want to know about Springfield's water works. 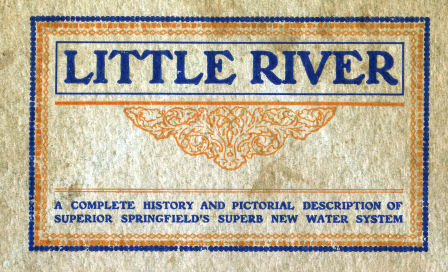 It is entitled Little River: A complete history and pictorial description of superior Springfield's superb new water system. It was published in 1910. According to the book King's Handbook of Springfield, published in 1884, prior to 1843 the city's water was supplied mainly by private wells. In that year, a reservoir, with eight miles of log pipes, was built by Hon. 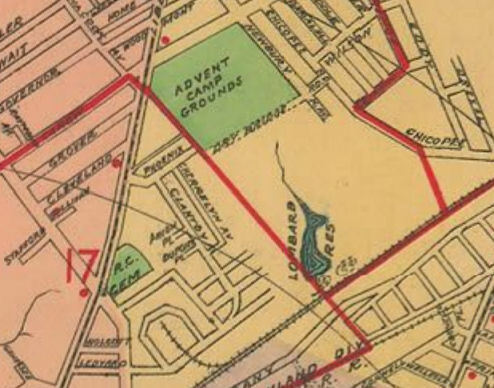 Charles Stearns on what was called "the site of the present Lombard Reservoir", which was located in the Liberty Heights neighborhood, near Freeman Terrace, off Carew St. 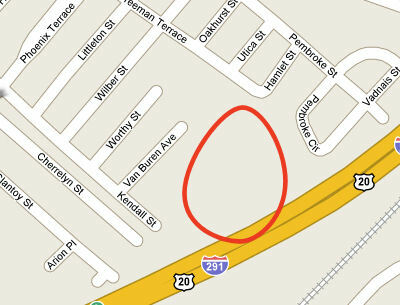 The former location is now a wooded/marsh area, with part of the site underneath Route 291. In 1848 the Springfield Aqueduct Company was chartered, succeeded by the City Aqueduct Company in 1860. This company was reported as controlling "the Lombard Reservoir and the two Van Horn reservoirs", the latter of which were presumably built in the preceding 12 years. 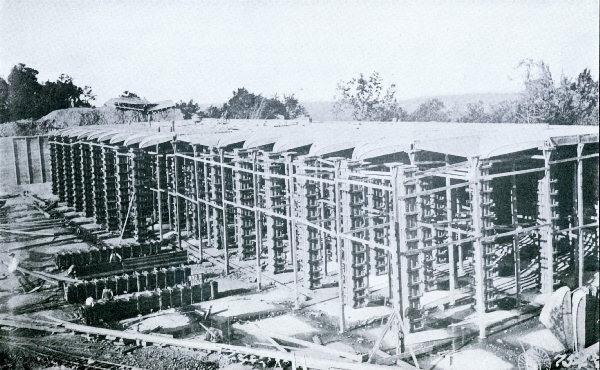 In 1873 the city purchased those three reservoirs. It also started constructing the Ludlow Reservoir, which lies in an area known as Cherry Valley, off Route 21 in Ludlow. This reservoir was completed in 1875, and it increased the capacity over the old reservoirs by twenty times. 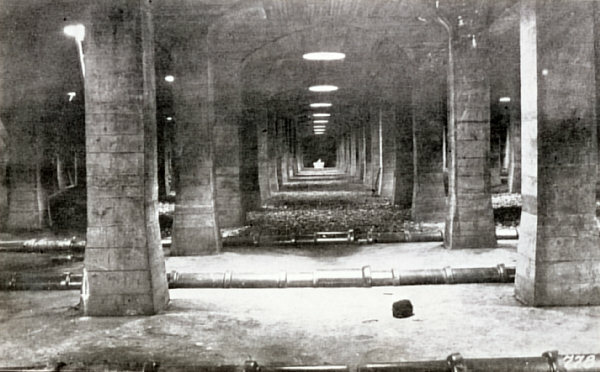 Although the Ludlow Reservoir improved both the water capacity and the water pressure in the higher parts of town, it was not without its disadvantages. King's Handbook reports that "The water from the main reservoir is, during the winter months, pure in taste and color, but, during a part of the summer, becomes less clear and somewhat unpalatable." A green scum was present on the surface of the reservoir each summer, described as "parasitic" by Dr. George Dimmock, since it ate away the carcases of the dead fish that washed up on its shores. But, as a small consolation, "deleterious influences have not generally been attributed by the local physicians to the Ludlow water, and it may be said to be, like a singed cat, better than it looks". It's no wonder Springfield began looking elsewhere for its water supply. By 1904, Springfield needed to find a new water supply. The Ludlow reservoir was both inadequate and unsanitary. The city first suggested diverting the Westfield River in Huntington, but Holyoke and Westfield strongly opposed this plan so it was rejected by the state legislature. Expansion of the Ludlow Reservoir, with the addition of filtering, was explored, but no technology at the time had successfully filtered such a unsuitable supply. 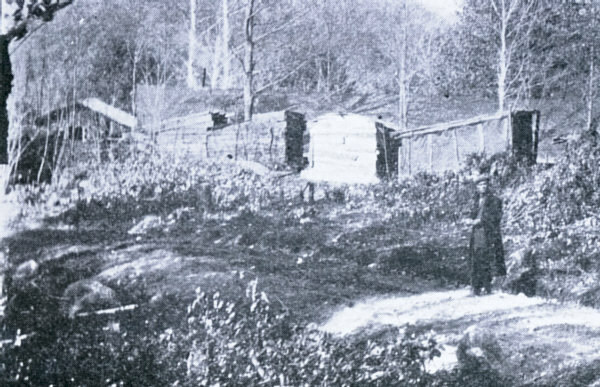 Everett StoneSpringfield Mayor Everett E. Stone instituted a private examination of the Little river in Westfield by expert engineer Allen Hazen of New York. Hazen determined that the Ludlow reservoir would be, at best, a temporary and difficult solution, and that the Little river was the best answer. The project was started in September 1907 and was completed in December 1909, at a cost of just over $2 million. The engineering behind the reservoir system is probably only interesting to engineering-types, but I'll try and distill it down a bit. The reservoir consists of five major parts. Storage reservoir at Borden brook, with a 2.5 million gallon capacity. The Cobble Mountain reservoir, located in the towns of Russell and Blandford, with a 75 million gallon capacity. The Cobble Mountain settling basin, with a capacity of 40 million gallons. The underground filter chambers, with a capacity of 30 million gallons. Here's a view of the interior. Life must have been pretty miserable for those workers, who were described as eating mostly bread and corn meal, along with spaghetti, beef stew, and canned goods. There have apparently been several expansions of the system since 1910. 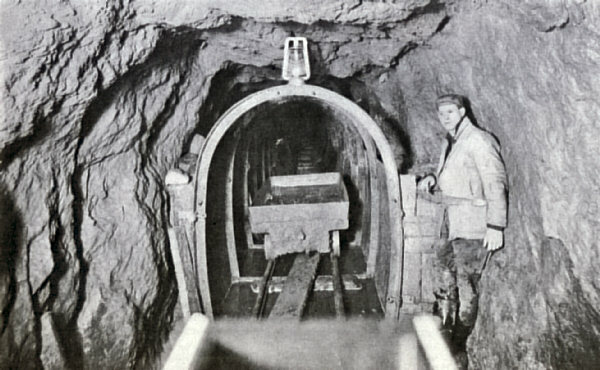 An Army Corps of Engineers document states that three more tanks were created at the Provin Mountain reservoir, one in 1932 and two more in 1958. In the late 1960's pipes were laid to tie into the Littleville Reservoir in the towns of Huntington and Chester. This reservoir was initially constructed in 1965 to store excess water to provide flood control for the Connecticut River. Here is a map that shows points of interest in the system. The blue line is the approximate path that the water takes. If you view the satellite photo, you can see the path because nothing sits on top of it, not even any trees. Springfield's Little River water system also supplies water to Ludlow, Agawam, Longmeadow, East Longmeadow, and at peak times, to West Springfield, Southwick, and Westfield. The Springfield Water and Sewer Commission owns about 13,000 acres of land in the watershed area, necessary to protect the water supply. The Commission lists as backup sources the Ludlow Reservoir and the Littleville Reservoir in the towns of Huntington and Chester. The next time you turn on that faucet for a cool glass of water, think about the 16 miles that water travels from the clear Little River system into your house. Submitted by Jim (not verified) on Fri, 04/04/2008 - 06:11. Thanks Ralph, great summary of the history. Submitted by TOM TOM on Sun, 04/13/2008 - 00:22. Has anyone ever read or seen the revitalization magazine that Springfield published? I think it was from the mid 70's. I just bartered a trinket box from of a historical hotel in Springfield for it and also got some forest park photos. It looked just like a cover from TIME magazine. I thought some of the downtown ideas were pretty great, maybe Mayor Sarno could get some ideas from that. Submitted by Anonymous (not verified) on Wed, 04/30/2008 - 08:27. Submitted by Anonymous (not verified) on Fri, 11/07/2014 - 13:45. Like most "rumors" this one is rife with errors. The Springfield Water and Sewer Commission has spent innumerable resources to insure that the Dam can be relied upon to contain the water and not be a hazard to the surrounding communities downstream. The closing of the access road to the dam was the direct result of suggestions by U.S. Homeland Secutity personnel, as water supplies are popular targets of terrorists. The financial condition of the City of Springfield has no bearing on the resources available to the water system, as the Springfield Water and Sewer Commission, is a seperate body politic, and not a department of the City. It's revenues are derived solely from it's water and wastewater fees and charges, and capital funds are both built into it's annual budget as well as financed through the issuance of bonded debt. I hope this clarifies this issue for you. Submitted by Anonymous (not verified) on Tue, 12/22/2009 - 21:07. The 'TIME Magazine' publication is available in the Reference section of the City Library in fair condition. That was a great read in general, and also in seeing some of the initial plans to hold Downtown up after the Retail Exodus in the 1960's. Submitted by David Maier (not verified) on Mon, 06/06/2016 - 22:14.